Joel Cooper should be back in squad for Crusaders game. If Glenavon can repeat their recent cup win over Crusaders this Saturday at Mourneview Park then a place in Europe via the league is back on. The Lurgan Blues suffered a blow last week with rivals Cliftonville edging into third place, but that can all change with a positive weekend. However, the fact Crusaders put one hand on the league title last week by beating Linfield is something manager Gary Hamilton sees as a huge factor in the game. 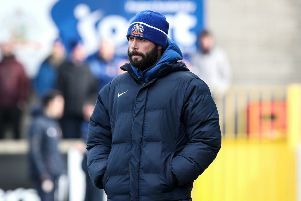 “I would have much preferred they didn’t beat Linfield because it would have kept the pressure on them, but they will come here relaxed knowing they are almost there,” says Hamilton. Injury problems are mounting for the manager, David Elebert is out after tearing a hamstring at Solitude and Mark Sykes could be out for another two weeks with a groin injury. Hopefully, Joel Cooper will have recovered from his chest infection which ruled him out of the Cliftonville game and Ian Morris is expected to get another outing after his impressive display at Solitude. n Tickets for the Irish Cup final will go on sale on Thursday via ticketmaster. They are priced at £15 adult and £8 concession. Glenavon have been allocated the South Stand. n The William Walker Club are running two buses to the final. Non-members can book a seat by calling 07887 487502.